Alkan Air flight training is partnered with Yukon College to offer a two-year Aviation Management Diploma program. Alkan Air flight training is partnered with Yukon College to offer a two-year Aviation Management Diploma program. Whitehorse is an excellent place to learn to fly. It offers unique experiences and challenges that are not found elsewhere in Canada. Students not only experience flying at an international airport with traffic including large airliners, but also fly to gravel strips in more remote areas of the territory. Canadian Flight Centre | Boundary Bay & Kamloops B.C. Canadian Flight Centre (CFC) opened in 1979 at B.C.’s Boundary Bay Airport, near Vancouver, and became one of the first flight schools to specialize in instrument flying and other advanced training. For students looking to sharpen their flying skills, tail wheel and aerobatic training is one of CFC’s specialties. Kamloops proximity to the mountains also allows pilots the opportunity for mountain checkouts. Chinook Helicopters | Abbotsford, B.C. Chinook Helicopters began training operations in 1982 at the Abbotsford Airport. The Abbotsford area is ideal for year-round helicopter training. Chinook utilizes the expansive Fraser Valley for all initial flight exercises, and the Coastal Mountain Range for intermediate and advanced exercises. Due to the extensive commercial helicopter activity in southwestern British Columbia, most approaches and landings are to actual industry helipads. Coastal Pacific Aviation | Abbotsford International Airport, Abbotsford, B.C. Coastal Pacific Aviation (CPA) started operations in 1973. CPA’s main business is a University Aviation Program in partnership with the University of the Fraser Valley. Offerings include a one and two-year Diploma, or a choice of a four-year Business (Aviation) Degree, or a General Studies Degree. CPA also offers non-university training for students who wish to complete their career flight training in fast paced year long program or self-paced flying for fun. Glacier Air has experience along the Sea- to- Sky corridor from Vancouver to Whistler. Glacier Air specializes in mountain flight training for fixed wing and rotary aircraft. Given the terrain, Glacier Air also offers survival ground school, which includes studies in weather, flight techniques, effects of density altitude, emergencies, route planning and aircraft preparation, and survival gear. Ocean Air Floatplanes | Victoria, B.C. Seaplanes are a way of life along coastal Canada. Coastal jobs require high levels of experience because of the many challenges that the coast offers. Ocean Air Training specializes in seaplanes. The company’s beautiful Gulf Island’s setting just outside Victoria and close proximity to Vancouver, creates a perfect training environment for learning to be an experienced bush/urban Seaplane pilot. Okanagan Mountain Helicopters started as a helicopter flight training school in 2003. Training in the Okanagan area provides the variety of terrain and weather that exposes a student to new challenges while under the supervision of skilled instructors. The training facility at Kelowna International Airport – the tenth busiest in Canada – introduces students to fully controlled radio procedures, multiple training locations for confined areas and mountain flying introduction within a control zone, and the best blend of controlled and uncontrolled practice areas. The Pacific Flying Club (PFC) was formed in 1965 as the Canadian Pacific Airlines Employees Flying Club. It remains one of the premier flight training and general aviation centres in Western Canada. Students train at Boundary Bay Airport, one of the busiest general aviation airports in Canada. PFC is also partnered with the British Columbia Institute of Technology, and together offers the diploma course, Airline & Flight Operations. Southern Interior Flight Centre (SIFC) is located at Kelowna International Airport in the heart of the Okanagan Valley, where students spend time flying in mountain valleys, visiting the Rocky Mountains, travelling out over the Canadian prairies and exploring the coast of British Columbia running along the Pacific Ocean. The area is also surrounded by many small air strips, which allow for exposure to every level of controlled and uncontrolled environments a pilot might encounter. Victoria Flying Club | Victoria, B.C. The Victoria Flying Club (VFC) has been training professional pilots since 1946. Located at the Victoria International Airport, one of Canada’s busiest airports, VFC specializes in mountain flying. In the Pacific Region, the combined effect of the great mountain system and adjacent Pacific Ocean lead to some extremely changeable flying conditions. VFC has partnered with the University of Victoria to offer a Diploma in Business Administration – Aviation Option program. Absolute Aviation is a flight training and aircraft maintenance facility, largely serving students from Edmonton and central Alberta. Absolute operates out of Wetaskiwin, Alta., with close proximity and access to major airports such as Edmonton International. The school operates in both uncontrolled and controlled airspace, eliminating costly ferrying time to training areas. The Calgary Flight Training Centre (CFTC) provides training for professional pilots and enthusiasts alike. Olds-Disdury Airport is uncontrolled airspace. There is no waiting for air traffic controllers to clear students’ take-offs and landings. Students are also able to start up the aircraft, taxi directly to the runway and take-off when safe to do so. Canadian Centre for Unmanned Vehicle Systems | Medicine Hat, Alta. The Canadian Centre for Unmanned Vehicle Systems (CCUVS) offers a 1.5 day condensed Unmanned Vehicle Systems (UAS) ground school course to both civil and commercial operators, covering a range of topics including, aerodynamics, air law and regulations, weather, basic UAS 101, and aviation chart and flight supplements. Students also receive instruction for an Industry Canada Restricted Radio Operators License (Air). CCUVS also offers UAS training in Ontario and B.C. Centennial Flight Centre has been operating since 1967. Located at Villeneuve Airport, approximately 25-kilometres north-west of Edmonton, Centennial offers a full range of training including a Recreational Pilot Permit, Private Pilot Licence, Commercial Pilot Licence, Multi-Engine and Instrument Rating. Villeneuve Airport has 3500-foot and 5,000-foot runways with approach lighting which are perfect for night flight training. Mountain View Helicopters | Springbank, Alta. Mountain View Helicopters (MVH) has been training pilots for commercial or private helicopter licences for over 15 years. The training facility is located near Calgary International Airport, providing several advantages such as exceptional flying weather found on the prairies, close proximity to the mountains for use as a valuable training tool and the experience gained through frequent contact with air traffic controllers operating out of one of Canada’s busiest airports. Mitchinson Flight Centre | Saskatoon, Sask. Since 1946, Mitchinson Flight Centre has been one of Saskatchewan’s leading flight training schools. The school is located in its own hangar at the Saskatoon John G. Diefenbaker International Airport. Students learning to fly with Mitchinson train in an ATC controlled environment, providing experience for flying in larger centres, but without the traffic delays and congestion of a larger airport. Mitchinson is owned by professional airline pilots who have trained at the school and know what it takes to get ahead in today’s competitive aviation industry. Brandon Flight Academy | Brandon, Man. Brandon Flight Academy has been placing qualified pilots in cockpits since 1936. Located at Brandon Municipal Airport, just outside of Winnipeg, Brandon Flight Academy offers one-stop training in a multitude of courses. Southern Manitoba has excellent weather and terrain for conducting visual flight rules (VFR) flight training. Brandon offers students a varied flight experience with the practice facilities close by and no delays on the ground or in the air, students experience an efficient and educational learning environment. Manitoba’s extreme four seasons allow pilots to experience all types of flying conditions from cold air performance to hot summer day. Harv’s Air is a family owned training operator with locations near Steinbach and St. Andrews, Man., both in the Winnipeg area. In business since 1973, the company offers comprehensive courses for both recreational flying and those seeking a career in aviation. Prairie Helicopters is a leading custom charter helicopter service and Manitoba’s only turbine helicopter flight school. Low traffic volume at the world-famous Gimli Airport – 45 minutes north of Winnipeg – provides ideal conditions for students to acquire radio communication skills pilots require throughout their careers. Real life bush flying is only minutes away. Winnipeg Aviation has been a leading trainer of pilots for over 20 years. The school’s base at St. Andrews Airport, 15 kilometres outside of the Manitoba capital offers three runways to maximize your training with and without cross winds. Instructors take students into Winnipeg International Airport to get first-hand experience to mix it up with the big players, while also flying to small short, uncontrolled grass strips to learn procedures. Brampton Flight Centre | Brampton-Caledon Airport, Ont. The Brampton Flight Centre (BFC) has been conducting flight training for more than 70 years. Located just northwest of Toronto’s Pearson International Airport, BFC teaches students to fly in a variety of airspace classifications, experiencing both controlled and uncontrolled environments. BFC is owned and operated by the Brampton Flying Club, and owns its airport. The centre has a tie-in with Sheridan College’s Bachelor of Business in Global Business Management, a strong fit for an ambitious professional pilot. The Diamond Flight Centre (DFC) in London is part of a network of Diamond flight training schools in North America, and provides high-quality, flight training using Diamond aircraft and Diamond-specific flight training simulators. DFC London is located at the London International Airport. The airport is busy enough that students acquire experience with traffic, yet is generally quiet enough so that students can practice in a relaxed atmosphere, without long waits for clearance. Durham Flight Centre | Oshawa, Ont. Durham Flight Centre (DFC) has been training aspiring pilots for 20 years. Located in the Enterprise Airlines hanger buildings on the grounds of Oshawa Municipal Airport, DFC charges competitive prices for ground training, instructor time and airplane rentals. There are major advantages to the Oshawa airport for flight training, including virtually no congestion, 24-hour operation, an air traffic control tower and modern navigational aids, extensive airport based facilities and more. From the Oshawa airport to nearly practice airspace the flight time is only about 10 minutes, which means less time and money spent travelling and more on training. Essential Helicopters is a leader in helicopter charters and flight training. Essential has developed an efficient model for providing all levels of service and specialization within the helicopter industry. Students participate in strenuous physical activities such as helicopter log pad construction, chain saw operation, underwater egress training, winter survival program and winter helicopter operations. Essential Helicopters is also aligned with the Canadore College Commercial Helicopter Pilot Licence and Pilot Preparedness program. Genesis Flight College | Collingwood, Ont. Genesis Flight College is a registered private career college located at the Collingwood Regional Airport. Through its affiliated holding company, Genesis owns the real estate and all the buildings on the field in which it operates. its students expect knowledgeable, highly trained professionals, premium training facilities, and an array of amenities. The facilities, flight training professionals and equipment at Genesis offer a breadth of services to students in the GTA and Georgian Bay region. A significant advantage of our program is that 100% of the flying is in advanced aircraft (DA40 and DA42). 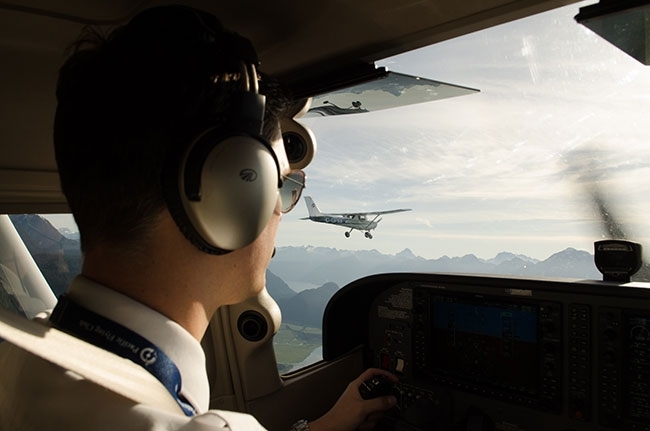 The program is designed to prepare students for direct entry into a commercial flying job with expert-level knowledge of the advanced systems of the DA40 and DA42 platform. Collingwood and Blue Mountain is a resort town and there are many accommodation options in the area. Students who like skiing or enjoy water sports will find lots of extracurricular opportunities. Genesis also has new accommodations being built at the airport, which will be ready in the summer of 2018. Services include commercial flight training, a college diploma program, private pilot training, instrument rating, multi-engine rating, instructor rating, sightseeing flights, and air taxi services. Great Lakes Helicopter offers helicopter flight training and charters. The operation is based at the Region of Waterloo International Airport, one of the best training airports in Canada. The region offers a unique blend of modern, energetic urban centres and scenic, rural landscapes creating diverse experiences for helicopter flight training. The training school also has a partnership with Conestoga College to provide a two-year Commercial Helicopter Pilot General Art and Science diploma program. Helicopters Canada | North Bay, Ont. Helicopters Canada trains students from across the country and around the world from its training facility at Jack Garland Airport in North Bay. Just minutes north of the airport are heavily forested areas that contain multitudes of lakes and rivers, providing the ideal location for helicopter training to prepare a student pilot for real life helicopter industry experiences. Ottawa Aviation Services (OAS) is a professional flight training and maintenance operation based out of Ottawa International Airport. OAS provides aviation professionals and enthusiasts with aviation services based on the values of the “golden age” of flight. The school specializes in designing customized, pay-as-you-go flight training programs that accommodate each student’s pace. The Ottawa Flying Club, operating as the Ottawa Flight College (OFC) has been training pilots since 1928, and is Canada’s oldest flight training college. The school provides float and instructor ratings, and supports a large number of recreational pilots who fly for fun. Located at Ottawa International Airport, students learn to interact with a control tower and operate in an airport control zone as part of their training. The school’s practice area is minutes away from the airport. St. Thomas Flight Centre | St. Thomas, Ont. Established in 1996, the St. Thomas Flight Centre has a flight training program customized to suite budgets and schedules. The school operates out of St. Thomas Airport in an uncongested flight training environment. School offices are located in the main terminal building and ground school classes are held on site. The Flight Centre has two additional satellite locations at Chatham airport and London airport. Spectrum Airways has been teaching students how to fly for over 40 years. The training facility is at the heart of Burlington Executive Airport, one of the busiest airparks in Ontario. Burlington Executive Airport averages 30 flights on weekdays and many more on weekends, and has become an exciting centre for general aviation enthusiasts. The Waterloo Wellington Flight Centre (WWFC) is located at the Region of Waterloo International Airport and is one of the largest and most experienced flight training centres in Canada. WWFC is partnered with Conestoga College and the University of Waterloo to offer diploma and degree programs. WWFC also has a well-developed network among entry-level aviation employers across the country. The centre also offers a UAV course designed to introduce people to the range of scope of the two categories of UAV’s (under 2 kg or from 2-25 kg). Air Richelieu is an accredited flight training centre that delivers both Canadian and American licences at the same time, and under the same roof. The school is located at St-Hubert Airport, approximately 20 minutes from Montreal. The airport provides a busy environment for training, but without the inconvenience of dense air traffic. The CQFA overs more than 50 courses, including a light unmanned aerial vehicle (UAV) professional pilot course, which has been offered since 2007. The 140-hour, light UAV training covers the regulations, aerodynamics, flight discipline and human factors for operating a light UAV aircraft. The course covers all phase of a drone mission within the framework of a commercial or public safety operation. All the theory necessary for the operation of a light drone for the purpose of a commercial or public security flight is presented and learned prior to practical flight. Dorval Aviation is the only flight training centre located at the Montreal Trudeau International Airport, Canada’s third busiest, and at the heart of one of the country’s main aviation centres. This strategic location provides all experiences required for successful training within controlled airspace. Dorval offers bilingual services and a complete selection of courses from a simple introduction to aviation to a commercial pilot licence. Laurentide Aviation has been providing professional flight training since 1946. Based at Les Cedres Aerodrome, approximately 25 kilometres west of Montreal, Laurentide offers bilingual inflight and ground school instruction to suit any style of learning. The flight school is located at an uncontrolled airport, allowing students to get in the air and into the practice area quickly, reducing the cost and amount of time spent on the ground taxing and waiting for clearance at busy controlled airports. Quebec City Flight School is a Canadian Helicopters’ flight school offering training to students and company pilots. Canadian Helicopters is Canada’s largest helicopter transport services company. The school offers introductory and recurrent training. Instructors are operationally experienced in a broad variety of fields, including air ambulance, offshore, mining, firefighting, aerial construction and spraying. Instruction can be provided in French and English. Debert Flight Centre, part of the Truro Flying Club (TFC), operates out of one of the best facilities in Atlantic Canada for flight training. Students learn in uncontrolled airspace that is not crowded with commercial jets and other air traffic. Debert is a compact airport offering students less than five minute from flight to the training areas. Ground school is held at Debert Airport and Halifax. Greenwood Flight Centre | Annapolis Valley, N.S. The Greenwood Flight Centre (GFC) is located in Nova Scotia’s Annapolis Valley, approximately one hour’s drive west of Halifax. Greenwood Flight Centre has been training pilots since 1958. Students often gain subsequent employment with the GFC. In addition to Kings County Municipal Airport, the school operates two satellite sites at Digby Municipal Airport and Yarmouth Airport in south-west Nova Scotia. GFT Aerospace has been offering elite flight training in Canada since 1992, and prepares pilots for the real work of aviation from its state-of-the-art training facility. Located in Gander Newfoundland, GFT proves to be beneficial because students experience real world weather conditions. GFT’s sister company, EVAS Air, is a local airline for Air Canada. Because of this, GTF has established its Career Progression Program, which is open to all students at no additional cost.